X.A.N.A doesn’t ‘t let a single detail of life at the school get by him. The Headmaster has decided to make extensions to the gymnasium and the super-calculator wastes no time before turning the bulldozers from the construction zone into weapons. Our heroes must nip this new attack in the bud before the metallic army has a chance to destroy the factory, thus making it impossible for them to get to the secret laboratory. 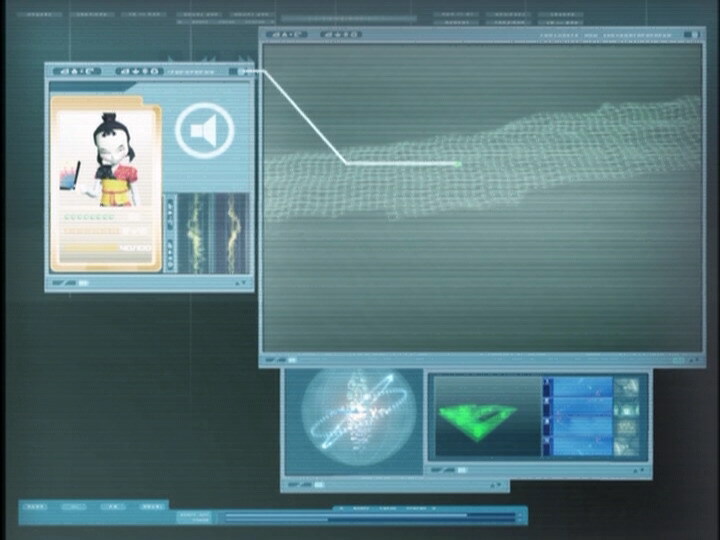 During the battle taking place on Lyokô, Yumi falls into the digital sea and turns into a virtual character forever. It ‘s a cruel dilemma for Jeremy who has just accomplished his life’s work by working out how to make Aelita into a real person. But he can only bring one person to life : will it be Yumi or Aelita? The principal has decided to renovate the gym with ultramodern sports equipment and facilities. The students meet in front of the site where two large bulldozers are parked, and they are subjected to Mr Delmas' pompous speech. Odd, Yumi and Ulrich don’t lend an ear to it, completely disinterested. Jeremy stayed in his room and is talking to Aelita, as usual. According to him, the materialisation program to bring the young humanoid to Earth has never been closer to completion. Aelita is excited at the simple idea of coming to Earth, and especially to meet her saver. She envisions the moment when she can see Jeremy, touch him and kiss him. The pink-haired girl’s impulsive and candid words make the brainiac blush. The previous program test didn’t work, but Odd, spilling a packet of lollies, activates the supersensitive keyboard; followed by wide eyes the program evolves, and the test is positive: the materialisation program is operational and can be executed, but only once (since the discovery of the code was accidental)! The teens decide to use the program in a few days, enough time to create a stable situation for Aelita’s real life, by giving her a false identity. 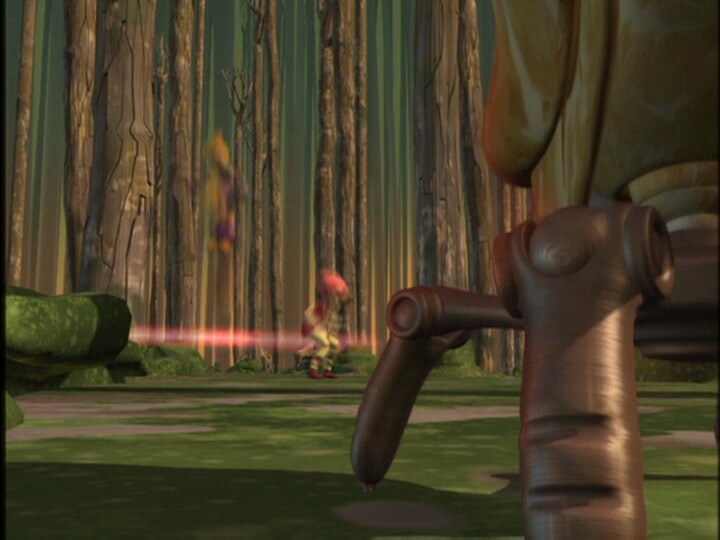 Jeremy virtualises Odd, who appears near Aelita in the Forest Sector where the pulsations are converging. Ulrich warns Jeremy on his phone that XANA’s target is none other than their factory, which includes the scanners that allow them to travel between the two worlds! 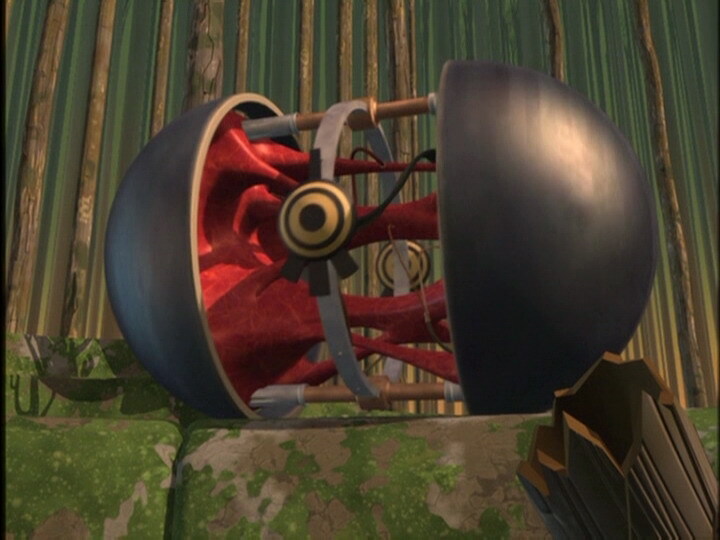 The machines arrive in the main room of the factory; the first attacks the foundations, the second, which Ulrich is locked inside, drives into a giant pole, knocking the boy out. Yumi jumps onto the machine and confronts the bulldozers to save her sweetheart. In the parallel world, the battle has already begun, against the Kankrelats. Odd dominates his adversaries but loses a lot of life points in defending Aelita from the lasers. In the factory, Yumi escapes the monsters, carrying the unconscious Ulrich on her shoulders, then she heads for the scanners. Time is short, the ceiling begins to crumble above the lab. The catboy almost destroys all his adversaries, and a flash vision comes to him: Yumi falling in the Digital Sea to save Aelita. His daze causes him to be devirtualised. Aelita heads for the tower, when a Megatank appears. 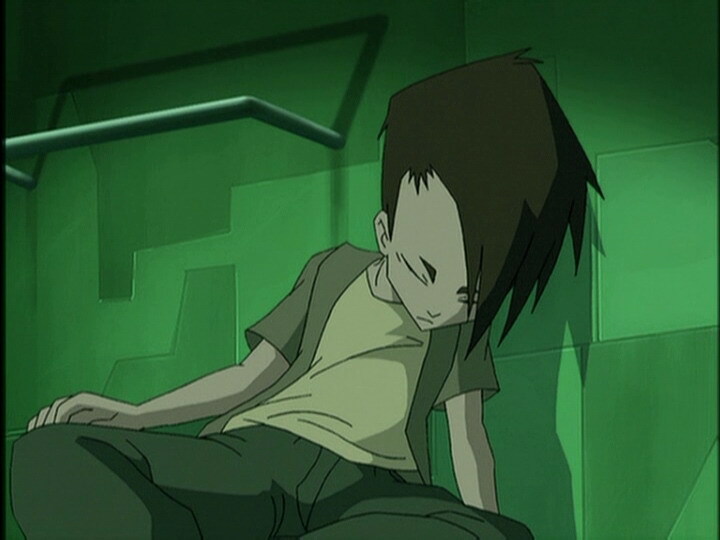 Its powerful elliptic shot would have killed the Guardian of Lyoko, had it not been for Yumi’s intervention as she threw herself at the body of the ball. The monster falls into the Digital Sea and Yumi grabs the edge of the platform, the deadly digital void beneath her feet. Ulrich, virtualised after hearing about the catastrophe, doesn’t arrive in time to save her; Yumi slips and falls into the Digital Sea, virtualised forever, not even the tower deactivation nor the Return to the Past can save her. The three humans are completely stunned and overwhelmed, their morale undermined…They have tragically lost their friend. 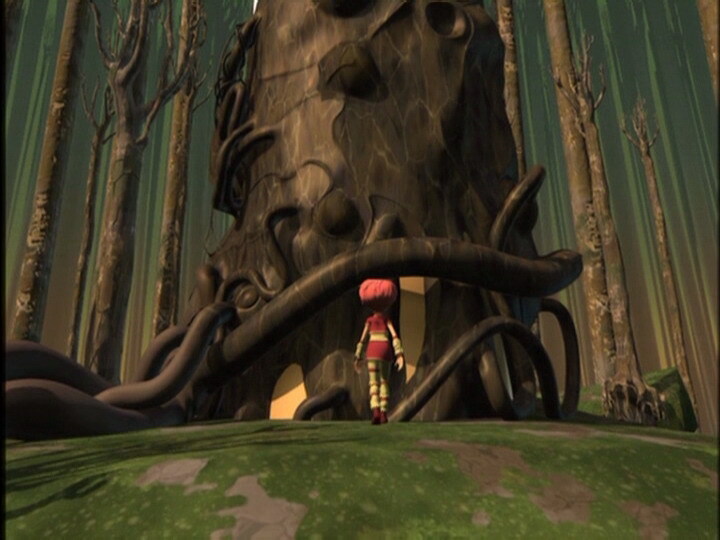 That’s when Aelita proposes an idea: use the materialisation program which was originally meant for her to save Yumi. The cruel dilemma reveals itself: Aelita or Yumi? 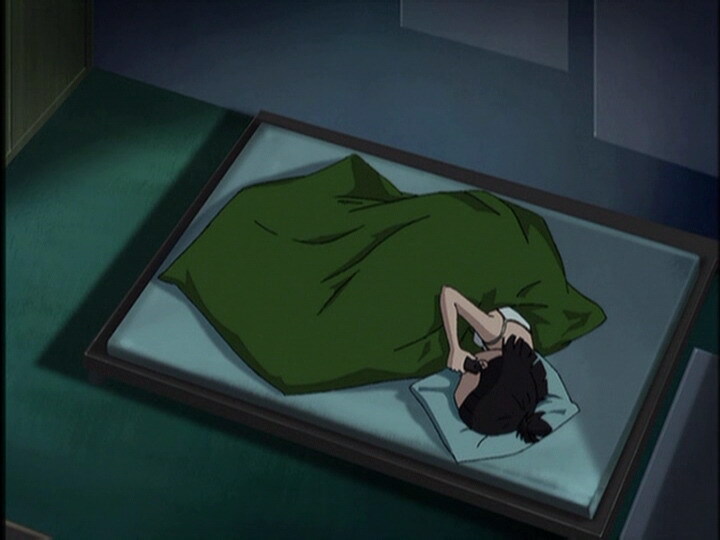 The former accepts her place, deciding to wait on Lyoko while her friend finds a way to remake the program. It’s crying in front of his love that the blond launches the unreusable program to bring Yumi back to Earth in a scanner. - Attack: Take control of bulldozers to destroy the holomap, Jeremy’s screens and the scanners. - Jeremy’s materialisation program works for the first time, due to a blunder by Odd…the program can only be used once. - Discovery of Aelita’s ability to send Jeremy visuals. - Discovery of Ulrich’s phone number. - First season 1 episode in which Sissi doesn’t appear. - Jim and Odd snore. - Ulrich sleeps with earplugs because of his friend’s snoring. - The principal’s eyebrows are grey when we see him. - The door of Jeremy’s room is brown instead of grey. - When Aelita runs, the bandages on her legs are identical. - Jeremy’s map still shows 5 monsters after Odd has destroyed one. 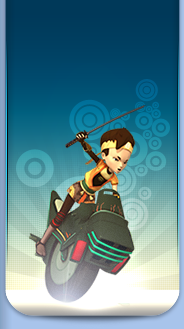 - Yumi’s outfit is reversed when the Megatank falls into the Digital Sea. - When Jeremy gets annoyed at Odd, the lollies which fell on his keyboard disappear. - When Odd grabs his skateboard, Jeremy’s scooter is still there, but this shouldn’t be the case. - The cushion on Yumi’s bed changes colour between when she stirs and when she responds. - When the return to the past is launched the buildings at Kadic are in sunlight even though it’s night time. 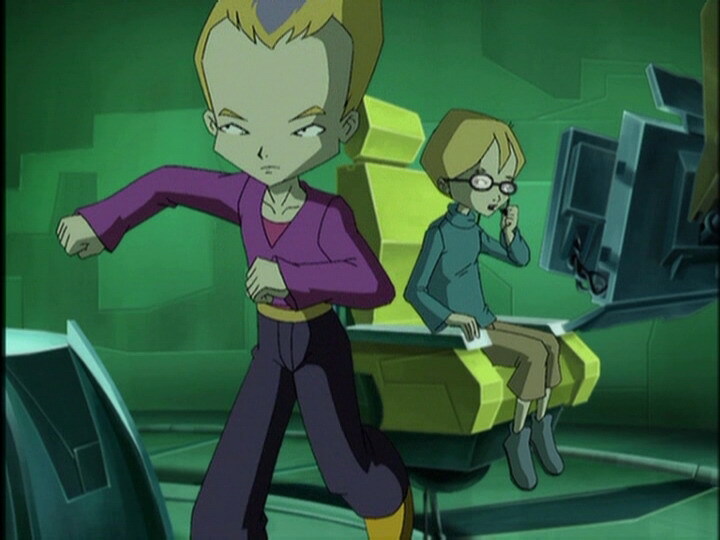 - Jeremy’s computer mouse disappears when he scratches his head and when he has his back turned while listening to Ulrich talk about Aelita. 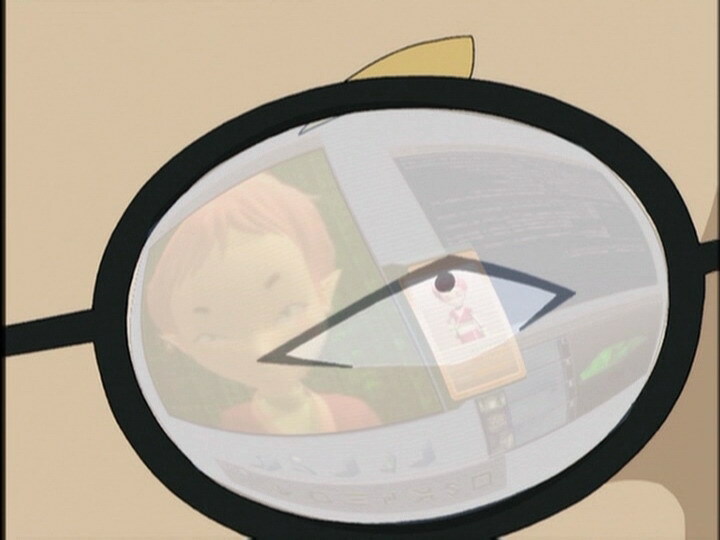 - Jeremy’s computer microphone disappears when he stresses about the program test and it’s on his left ear when it was on his right earlier when he asks Aelita if she’s asleep. - Odd’s pants are the one shade of purple before he enters Jeremy’s room, when Jeremy cleans the lollies off his keyboard, when Odd runs with Jeremy and Ulrich, after Ulrich says that Odd will come with him to take care of the bulldozers, when Odd leaves for the factory; his pants become the darker shade of purple when he’s with Jeremy heading for the scanners; the colours are reversed when he talks about his flash vision; they change again when he sees the ceiling collapse, when he sees Ulrich and helps him, then they become the lighter shade before and after Yumi falls out of the scanner. - Odd’s second Future Flash vision. - Ulrich’s phone number is the same as Yumi’s and Odd’s; 665-225-958! - A joke circulating includes this episode as the one that begins a long series of misadventures for Yumi, lasting five episodes: “pick on Yumi week” (fallen into the Digital Sea; imprisoned by a Guardian; chased by an alien; targeted by a satellite; chased by samurai armour). 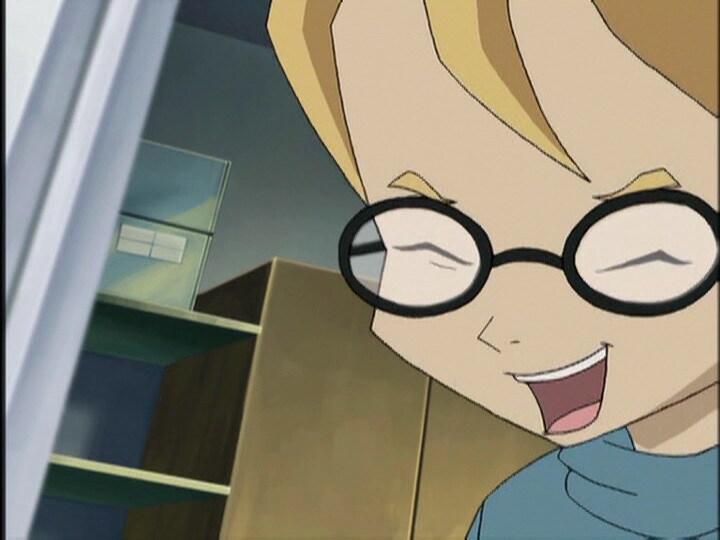 - Jeremy confirms that on Lyoko your only senses are sight and hearing. - Kankrelats are referred to in this episode as Roachsters. Juvenal is a Latin author who lived in the first and second centuries AD. He was, besides being a satirical writer, professor of rhetoric. Principal: Dear students, this magnificent stadium is being built in close co-operation with the board of education. Soon, you will be enjoying the latest in sports equipment! And I personally am delighted, since my duty is to provide you with the finest working conditions possible, and in all areas. Both intellectual and athletic! Since, as Juvenal said, a sound mind in a sound body! Odd: Wow, can he talk…do we really have to listen to all of this? Ulrich: Not really. You could’ve stayed with Jeremy if you wanted to. Yumi: What’s Einstein up to anyway? 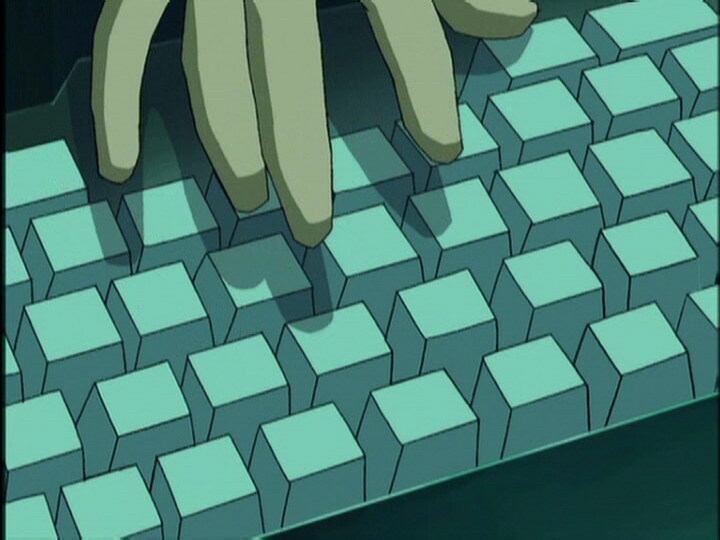 Odd: The usual, he’s glued to his computer screen in a big cyber-conversation with his darling Aelita. Aelita: Oh, honestly…it’s so hard to imagine! We can be face-to-face in the same room…we can touch each other, even kiss! Jeremy (blushing): Uh, yeah! That’d be…uh…hm…ah, interesting! I mean, well, uh…I guess! Now, get ready! I’m starting the test program! Jeremy: …I’m beginning to wonder if I’m up to the job…if I’m good enough for a complicated program! Uh…sorry, I’m just tired and jumpy, that’s all. I’d better go and stretch my legs. Jeremy: Odd! How many times have I told you not to touch my computer when I’m not here?! There are months of work in there! Odd: Relax, Max! I didn’t hurt your little toy! Jeremy: Oh no, you’re such a cosmic creep! Now look what you’ve done! Those keys are incredibly sensitive! Odd: Ok, ok, a little piece of candy’s not going to wreck your keyboard! Jeremy (looking at the screen): Huh? That’s crazy! This is really mega-insane! Jeremy: Odd, you’re a genius, you know that? Odd: Hey, make up your mind! Am I a, a genius or a creep? Jeremy: You’re a creepy genius! Ulrich: Hey, come back to Earth, Jeremy! And try to be practical for once. Aelita has no parents, and she hasn’t got a birth certificate. What’s more, she’s not enrolled in any school. O-ok, that’s no biggie, but…all that together means she doesn’t exist in our world! 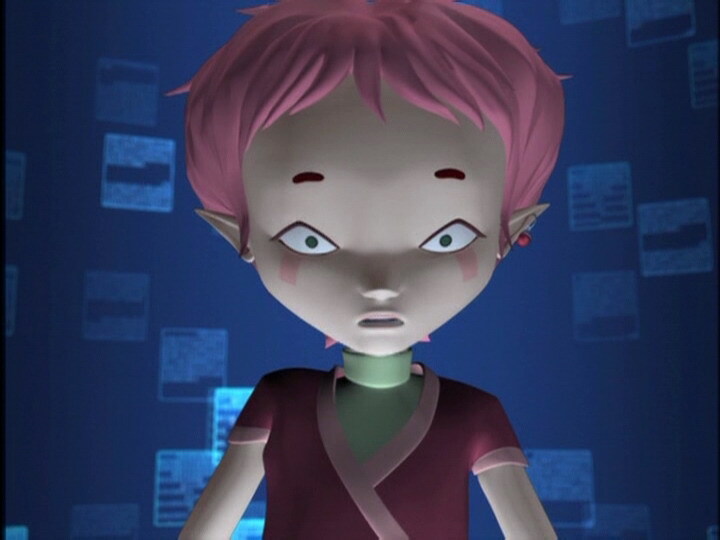 Odd: Imagine, “Hello, I’m Aelita! I just got here from a virtual reality!” That’s a one-way ticket to the nuthouse! Aelita: Come on, Jeremy, you know that virtual beings never sleep! Jeremy: Odd! Wake up! XANA’s attacking! ODD!! WAKE UP!! Odd: Wh-what was that? Wh-what did you say about carpet tacking? Odd (talking about the earplugs): Hey, do you always sleep with those things in your ears? Ulrich: Yeah, Odd, always. And one of these days I’ll tell you why! Odd: No need to look any further, guys. This time he picked a real winner! He’s attacking us with bulldozers! Jeremy: Come on, Yumi, get up! We really need you! Yumi: Do you realise what time it is? Bulldozers? What bulldozers? What?! Odd: Ulrich? He’s on the bulldozer…trying to find what XANA’s up to. Ulrich (on a bulldozer): I’ll do my best, but I can’t promise you a graceful entrance! Odd: Hello Roachsters! Now which one of you wants to be first? Jeremy: Hey, would you cool it, huh Odd? Your mission is to protect Aelita, remember? Odd: You wanna trade places, Jeremy? Odd: Jeremy! I’m starting to get a little lonely out here! Jeremy: That answer your question? Ok, Odd, Yumi’s on her way! As for Ulrich…let’s just say he’s fast asleep. Odd: If he is that must be tough. I mean without his earplugs. Odd (destroying a Kankrelat): That’s it for you, where’s your buddy hiding? Yumi: No problem, I’ll hurry! I wouldn’t mind a little nap before class! Odd: There it is! That’s exactly where I saw Yumi fall! Ulrich: It’s all my fault! If I’d been faster, she would still be here! Ulrich: Can you…bring Yumi back here? Jeremy: Yes, but I can only materialise one person. One and only one. Aelita: Then choose Yumi. She’s part of your world already. Jeremy: I’m happy, and at the same time, I’m sad. Aelita: Why? At least you know the program works! You just have to set it back up again. Odd: Hey Jeremy, want some candy? Jeremy: Hey, what are you doing with that? It’s mine! Odd: Oh yeah, I guess it is! Ok, no problemo! Here you go! Yumi: Come on, have one. Candy can fix anything! Even a broken heart! Jeremy: Heh…if you say so.